The former US Geological Survey biologist had beginners luck with the first couple reptiles when he spotted a 3.5-foot-long serpent in a tree about waist high off the ground. He ran to grab the snake, but suspects the tall grass he stepped on between them tipped the invader off early. He tried to grab it by the tail—not the right way to capture a snake—and missed completely due to the thick leather gloves he was wearing for protection. The snake took off. “There’s dense foliage so you cannot get through it quickly. By the time you even look down they’re gone,” said Knox, now a resource manager at the Maui Invasive Species Committee. 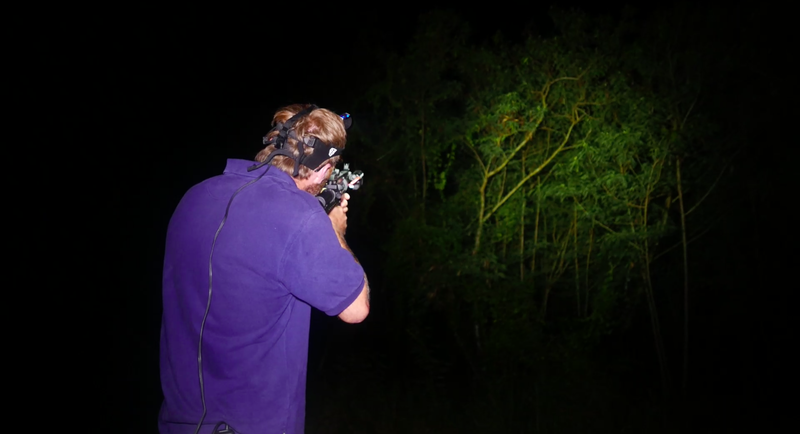 While these snakes are nearly out of control on Guam, with some estimates putting them at more than 1.5 million individuals, Knox believes airsoft guns can help researchers eliminate snakes which might make their way to new islands like Saipan or those in Hawai’i before they cause much damage to the local wildlife. He says that the idea came from locals on Guam who already used the guns to kill the snakes around their houses. Knox and his collaborators from USGS and Colorado State University took some into the lab and tested shooting captured snakes from a fake tree. “We found most of the snakes just dropped to the ground and stayed within a few meters,” he said, adding that the pellets sometimes killed them right away. Otherwise, the snakes could be euthanised within a few minutes. The guns the researchers used are automatic and had tracers, making it fairly easy to hit snakes even during the night, when they are most active. Knox says the guns are particularly helpful because these snakes are easiest to catch when they are first sighted. He says that his taskforce has spent weeks to months finding rogue snakes after hearing reports, if at all. If a snake escape, his team might not get another chance. Christy Martin, program manager at CGAPS-Coordinating Group on Alien Pest Species, a partnership of agencies and non-governmental organisations working together to protect Hawaiʻi from invasive species, praised Knox’s research into this technique, noting that it can be very difficult to get to the reptiles, especially when they are 25 feet up in a tree. “We need more tools to deal with not just brown tree snakes but other species,” she said. The Hawaii Invasive Species Council says that eight brown tree snakes were found dead or alive between 1981 and 1998 and Knox says that one sighting was reported in 2004, the council say that the reptiles aren’t known to be established in the state. But Martin says that other invasive serpents are. These problem snakes were often initially pets which were later released or escaped. Others come in as unintentional hitchhikers, hiding out in old boxes people transport while moving or getting into aeroplanes via landing gear. She says that the state, which has no native snake species, has had 236 credible snake sightings reported in the last decade. But until people figure out how to secure those borders from the serpentine invaders, toy guns may be their best hope.